As noted in the first post, this series is meant to explain how and why Australia might use credit from the Kyoto periods to make life easier for ourselves under Paris. The series, so far, has been building to this post. 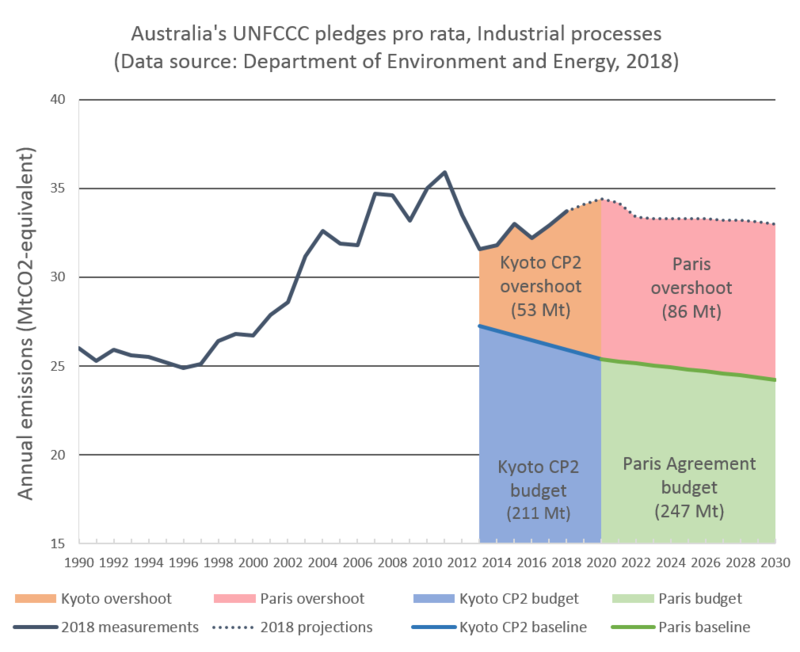 Here, I will convey the above points and why Australia’s attempt to carry Kyoto credit into Paris is deeply problematic. This is post is a bit grumpy toward the end. Forgive me. This topic makes me cross. I hope that by the time you get to there, you will at least sympathise. I expect you might be grumpy yourself. I sympathise. To understand this topic, you need certain foundational knowledge. If you haven’t read at least the first post in the series, I suggest you do so now. It will help a lot in understanding what I mean when I talk about budgets and baselines, as well as our goals for Kyoto CP1, Kyoto CP2 and Paris. You can probably skip the second, but it might help to read that, too. This chart builds on those in the previous posts. Here, I have added our Kyoto CP1 budget (2008-2012). 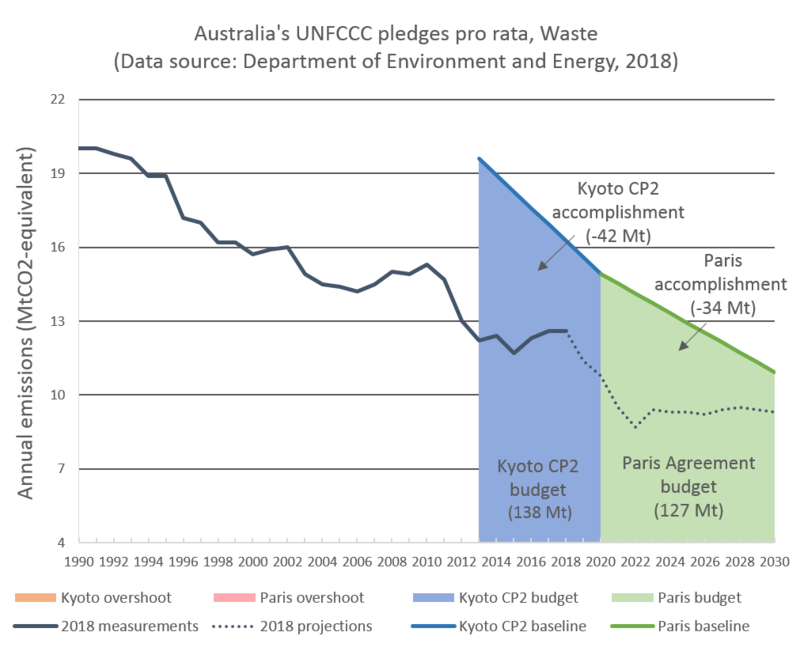 I am also using the Commonwealth Government’s calculations of the Kyoto CP2 and Paris baselines (which differ slightly from my own) in this instance. My calculations are not relevant. Kyoto CP1 covers the period 2008-2012 inclusive (i.e. five years, not four). That target was to maintain emissions across the whole period to less than 108% of our 1990 levels. Unlike our the way we calculate our Kyoto CP2 (2013-2020) and Paris (2021-2030) goals, it is calculated as flat. The baseline there is 108% of 1990 in all five years. For technical reasons,* here it is drawn at a slightly incorrect position to give the correct impression of our ‘achievement’ in that period. In 2015, we completed our UNFCCC ‘True Up Period Report‘ for Kyoto CP1. This report is the final word on achievements from that period. We have 128 Mt of credit on hand for use in the future out of that period. That credit is the amount we out-performed Kyoto CP1. That is, it is our total maximum allowance for the period, minus our accumulated emissions in 2008-2012. However, the baseline for Kyoto CP1 is narrowly higher than our highest emissions on record. During the relevant period, we never came close to exceeding our baseline. Consequently, our ‘accomplishment’ under this period amounts to nothing. The reduction that came, when it came, began with the global financial crisis, a period of reduced economic activity that created a similar dip in emissions across the developed world. The Gillard-era carbon price didn’t start until right at the end, and made no appreciable difference to the rate of decline in our emissions on a national scale, even if it did in specific sectors like electricity, industrial processes and waste. It is possible that the endless talk about the carbon-price-that-never-arrived in the Rudd-era did lead to some reduction in emissions as businesses tried to get a head start. However, I am morally-opposed to high-fiving a failure to deliver on meaningful climate action. And I won’t here. As much as it might be nice to offer high-fives all around on our Kyoto CP1 performance, the truth is that our baseline was simply far too high, and it would have been virtually impossible for us to exceed it, especially if you allow for the historic fact of the GFC. The GFC couldn’t have been anticipated in 1997 when our Kyoto CP1 goal was set, but we shouldn’t get credit for it occurring either. Our 128 Mt of ‘credit’ from this period is nonsense, I’m afraid. There is no measurable environmental benefit that it is based on. And so, while our [Kyoto CP2] 2020 emissions are expected to be virtually identical to what they were in 2000, under Kyoto rules, we can still say that we met our goal of reducing emissions by 5% compared to 2000 by 2020. The way the baseline works, our ‘5% below 2000 levels by 2020’ goal is actually an average 2% increase on 2000 levels in each individual year. Of course we met our Kyoto target, it was a ridiculous target for a developed country! The headline figure, a 5% reduction on 2000 levels, already made our target the weakest in the world under Kyoto CP2. However, the high starting point meant that we didn’t have to reduce our emissions at all in Kyoto CP2. We just had to not grow by much. Our ‘accomplishment’ under Kyoto CP2 will amount to a further 240 Mt of credit if the Government’s projections for 2019 and 2020 prove correct. Factoring in rounding, when you add Kyoto CP1 and Kyoto CP2 credit together, our cumulative credit becomes 367 Mt over the two periods. Imagine that the baselines for Australia were actually difficult under the Kyoto periods. Imagine they were something that took actual effort to stay below. And imagine–this is where I might lose some people–that we not only reached that difficult target through deliberate and thoughtful interventions, but that we exceeded it. Carryover at the UNFCCC is intended to reward this kind of good behaviour in one period by allowing countries to deduct from our future abatement task any previous over-achievements. If that is what happens–if it comes from actual effort–then of course it is principled and justifiable to grant this advantage. You could make arguments that it encourages back-sliding (weakening of ambition over time), but it is at least defensible. What carryover credit should not do, however, is allow a country like Australia, with a very poor baseline under both the Kyoto commitment periods, to claim benefits for its pathetically unambitious goals. Australia’s ‘credit’ comes with no measurable environmental benefit. At all. None. Not one molecule of a greenhouse gas. However, this credit still counts as real under the various UNFCCC rules. It is not at all defensible that it should. Under the Kyoto rules, this abatement from previous periods is stored in a ‘previous period surplus reserve’. This is a complicated name for stored credits from past commitment periods, available for use in future periods. Under Kyoto rules, you could only carry forward credit from one period to the very next period. If this rule applied to Paris, it would mean that you could carry abatement from Kyoto CP1 to help you meet Kyoto CP2. If Kyoto CP1 credit isn’t used in Kyoto CP2, it becomes worthless at the end of 2020, it cannot be used for Paris under Kyoto rules. Importantly though, the international community is not using the Kyoto rulebook any more. Everything is up for renegotiation in Paris. That includes this rule. This is something the recent UNFCCC conference at Katowice was supposed to decide on. It couldn’t, and the issue has been kicked down the road to next year’s Conference of the Parties. 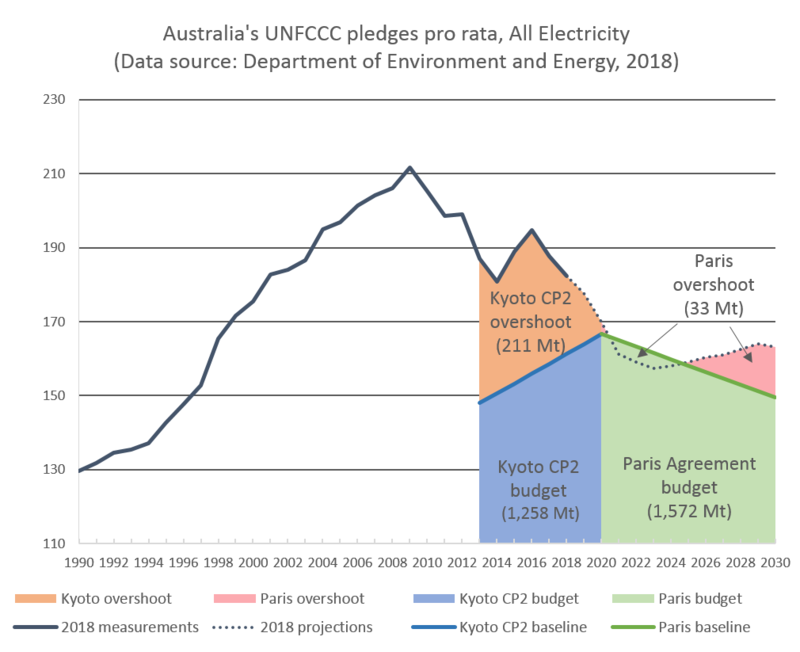 What Australia wants to do is to carry forward all that credit from Kyoto CP1 and Kyoto CP2, and use it in Paris. This allows us to reduce the size of our outstanding abatement task. Substantially. I’ve fired a lot of numbers at you in this series, and I promise we’re pretty close to the end of them. But here are a few more: The end point of our Paris goal is 12% below where we should be at the end of Kyoto CP2 (-5% on 2000). If you include the transferred credit from Kyoto CP1 and Kyoto CP2 as a de facto boost to the baseline, our Paris end point is worse than the end point of Kyoto CP2. It is only worse by 1%, but ‘worse’ is not something we can afford right now. ‘Worse’ is an insane proposition. Even with ridiculous and undeserved transfer of international abatement, even with ‘worse’ being the de facto goal, our domestic policies are still not enough to reach it. As shown above, and in the Government’s own report, we are expected to miss ‘worse’ by 328 Mt. That amount of overshoot is equivalent to five years’ worth of emissions from the whole country’s agricultural sector. Even if we didn’t use the carryover credit, Australia’s Paris goal is woefully inadequate compared to the rest of the international community’s efforts. Australia has repeatedly been judged to be at the back of the pack. Personally, I would argue that we are the very bottom of the developed world, largely because most of these reports do not consider the huge advantage we get from the LULUCF trend since 1990. Even if our Paris target was commensurate with the international community’s individual and collective efforts, the international community would still not meet the goals in the Paris Agreement. And, even if the collective international ambition was enough to meet the Paris Agreement, the goals in Paris aren’t enough to ensure a safe climate. Is it any wonder I don’t sleep well? I could talk to the unfairness of carryover, and how it violates key principles of the UNFCCC. Namely, this advantage is only given to developed countries, because they are the only ones who had emissions reduction targets in the Kyoto periods. This is approach goes against key provisions of the UNFCCC. I could talk to the fact that despite this, Australia will almost certainly get its way on this issue. 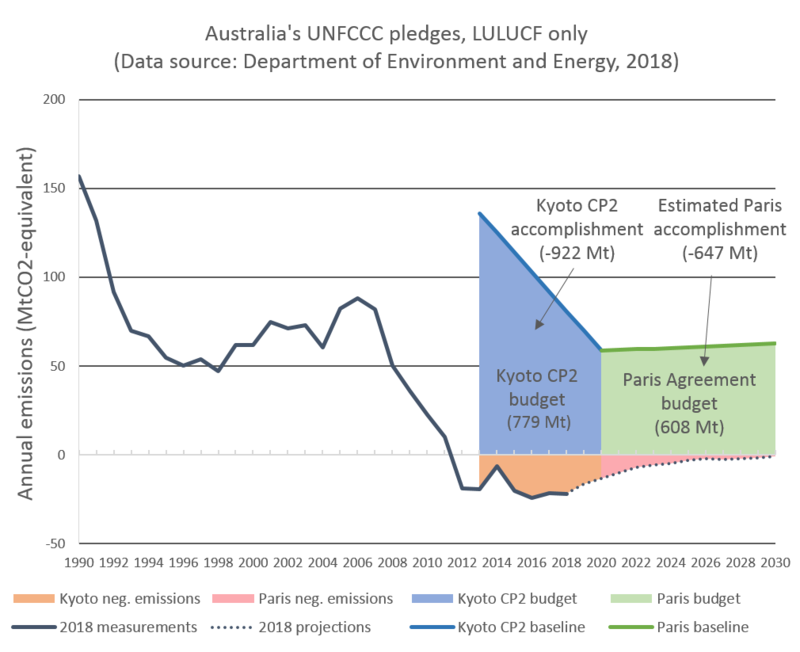 The Australian Government is literally counting on it, and included the carryover from both periods in the latest round of emissions projections. Our track record at the UNFCCC is such that we almost never lose. I could talk to the gross lack of leadership in our major political parties, where the ALP, just like the Coalition, has failed to rule out using this credit, even though many other developed nations have. There is daylight between the parties on some aspects of climate policy, but none here. I could talk to the opportunities we are squandering, as the sunniest continent in the world, with wind resources only exceeded by Antarctica. We could be leading the world on climate change selling our expertise to the world in this necessary transition. But we refuse to. I could talk to the natural disasters that will surely follow if we fail to act appropriately and how Australia is one of the most exposed nations to these disasters in the world. The Great Barrier Reef, a natural icon of unparalleled importance to the world and the Australian identity, is literally dying before our eyes and that’s not even the most frightening thing the future has in store. I could talk to the fact that Australia is the largest coal and gas exporter in the world and that looking only at our domestic emissions is not an accurate reflection of the scale of the harm we are doing to the climate. To use a common analogy, users of illicit drugs are of course responsible for the harm they cause and suffer, but most would agree that the kingpin drug dealer is responsible for a greater, or at least very large, part of that harm. We are the kingpin. But maybe I’ll do that another time. Right now, I’m angry. And if you aren’t too, I take full responsibility. I clearly haven’t explained things properly. * The reason I have left Kyoto CP1 off previous versions of the charts is because it is incorrect to draw it as 108% of 1990 levels as we understand them today. However, drawing it at the correct level is misleading. Here, I have chosen the first approach to avoid drawing two separate emissions lines and complicating the chart more than necessary for a lay audience. The reason for the complication is because there was a major revision made to the way we calculate our LULUCF emissions in 2016. This revision increased the impact of LULUCF emissions and sequestrations considerably. At this time, we recalculated our historic emissions and, in years where there was a large amount of land clearing, such as 1990, our emissions increased significantly. This revision definitely made our life easier under Kyoto CP2 and Paris. Along with 1990, LULUCF emissions were relatively high in both 2000 and 2005 (link to chart), and these were the base years for Kyoto CP2 and Paris, respectively. The trend in LULUCF emissions over time, generally, means that these revisions make our emissions in the past look far worse and the present far better than they did before. By the time of the revision, Kyoto CP1 has been finalised with our ‘True Up Period Report’ to the UNFCCC in 2015. As noted above, this report represent the final word on Kyoto CP1, and no subsequent revisions to our methods for calculating emissions can change anything about the legal effect of that commitment period. However, what this revision also means is that it is hard for me to graph Kyoto CP1’s actual baseline while maintaining fidelity to the fact that we were never close to exceeding it. In the chart above, I have drawn the baseline at 108% of current 1990 levels in order to give an accurate representation of this fact. The baseline as drawn sits at the same relative position to our highest ever emissions as the actual Kyoto CP1 baseline did before the revision. I’m Tim Baxter, a Fellow of Melbourne Law School. Enjoy and leave comments on any posts you read, but please do not cite any of my work here in an academic setting. Many of these posts will be half-finished and so there will be mistakes (please let me know if you find one). Also, and here comes the standard legal disclaimer, while in this blog I discuss the law and certain hypothetical scenarios with how it might be used. These are expressly hypothetical and do not form the basis of legal advice. You’ll need to look elsewhere for that, I’m afraid. Everything on this blog is covered by a CC-BY-NC-ND 3.0 AU. That means you can share it, for non-commercial purposes, so long as you attribute it to me. I do ask that you let me know, but this is just as a matter of manners. For commercial purposes, we can negotiate. I acknowledge the traditional owners of the land on which I work, live, and raise my family. The Wurundjeri people of the Kulin Nation have, for tens of thousands of years, maintained a complex and sustainable society. I pay my respects to their elders past, present and future. I also recognise such acknowledgements are insufficient to make up for the harm my forebears inflicted upon their people and culture, and pledge to work toward true reconciliation.